Content marketing is used to engage prospects and customers with important pieces of knowledge designed to help them and their business. Your goal with content marketing is to inform and engage. However, many companies do not know how to build an effective strategy. 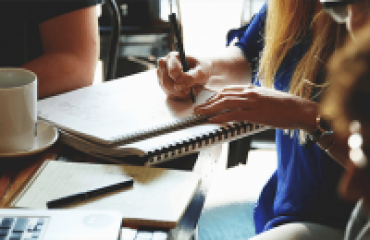 Others struggle with implementing a content marketing plan. And almost everyone has a challenge with quantifying the value of content marketing to upper management. First of all, I think a lot of people try to make content marketing into this new trend. Content marketing, as defined in Wikipedia, is any marketing that “involves the creation and sharing of media and publishing content in order to acquire and retain customers.” It is information that can be shared or distributed in a variety of ways, including as news, video, white papers, e-books, infographics, case studies, how-to guides, question and answer articles, photos and more. Well, it should. I am willing to bet that 100% of you reading this have engaged in some form of content marketing in your professional career. In fact, the whole point of marketing is to create demand or interest. Therefore, when you think about it, content marketing is just marketing. So, what is all the fuss? The truth is – content marketing may be another way to say “marketing,” but the label does add some context to the fact that as marketers we need to produce more information (or content) for our prospects and existing customers. Just remember that when you think of content marketing – its more than writing blog posts or sharing things in social media. The term is really designed to cover the entire scope of your marketing strategy. Now we come to the value of content marketing. 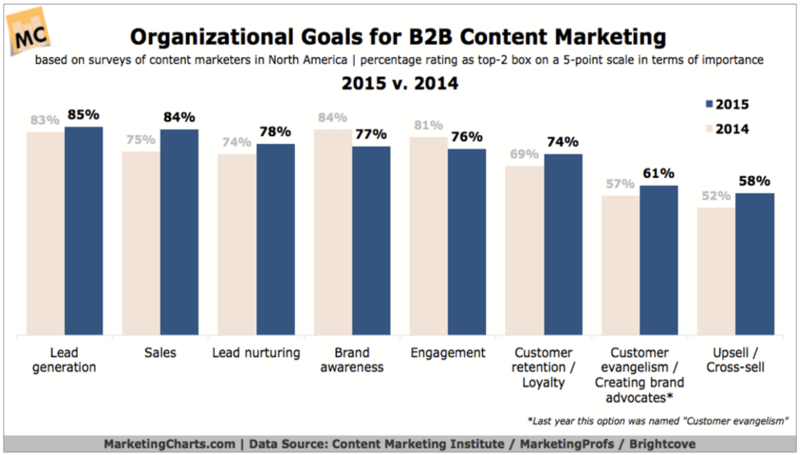 In my view, the value of content marketing is measured by two things: 1) Your content marketing goals. 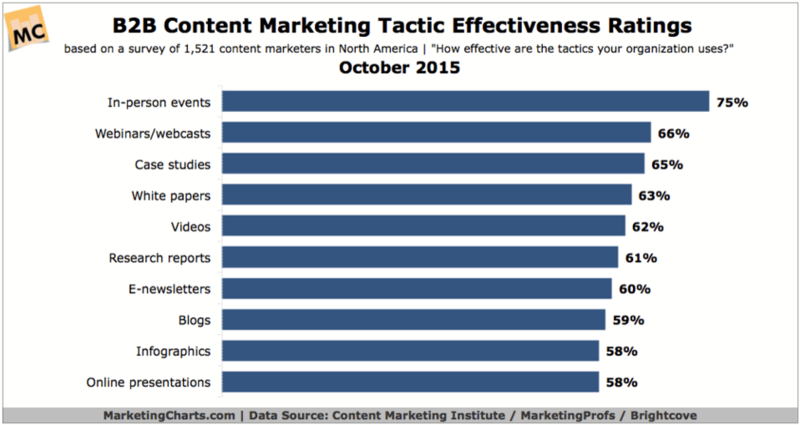 And 2) Your content marketing effectiveness. These two charts, which are in the webinar slide deck and video, help to illustrate what I am talking about. When you start to build out your content marketing strategy or plan, you need to think about what your company’s or organization’s goals are, how you are going to measure those goals, and then how you will identify which tactics are effective. So, how do you go about creating a content marketing strategy? I included this basic checklist, because building out a content marketing strategy does take planning and requires a solid process. In fact, when it comes to getting stakeholder support – the first action item – you will most likely have to repeat that one process with each step you go through. What I mean is that when you decide to create a new content marketing program (a blog, a webinar series, etc), you need to share that idea and get approval to proceed to the next step. Then as you build out profiles for your target audience, you will want to go back to your stakeholders and make sure your data and profiles are accurate and receive approval before you move on to identifying the right content formula. Stakeholder support is the most important and repetitive part of creating a content marketing strategy. It also can be the most frustrating, because you may end up getting to know your customers better than your senior managers or executives. Once you get your preliminary stakeholder approval, the next important step is understanding your audience. This is where you will need to build a customer persona. A customer persona is a representation of your ideal customer based on market research and real data about your existing customers. When creating personas you should start off by basing them on existing customers, their demographics, behaviors, habits, motivations and needs. Detail is important. Every buyer should meet one of the personas you create. As you get a clear window into who your customers are, you can then start to establish what they like. What kinds of business challenges do they have? What opportunities are they looking for? What kinds of content do they read, where do they read it and when? All of these questions and more will help you get to the next phase, which is learning what is the right content formula for your audience. You can then go to building an editorial calendar that helps to meet the needs and interests of your prospects and customers. In the implementation section of the webinar, we talk a lot more about the technical side and tactics. Specifically, we are very focused on information architecture and SEO. The reason is that if you do not have your website structured well for content, and you are not optimizing your topics, titles and content for people and search engines, you are not going to give yourself a chance to succeed. I like this definition, especially the word “findability.” If you think back to what marketing is all about – generating demand / interest – being found is pretty important. Given that most adults (I think it is over 80% of all internet users) will conduct a Google search each day to find information, your ability to be found in those searches should be the most important part of your web and marketing strategy. 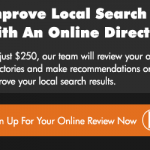 Think of search engines as question and answer engines. 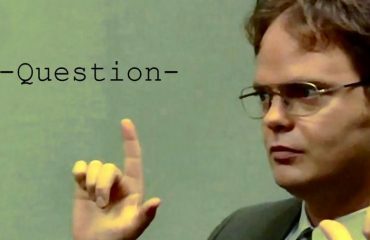 Your prospects and customers are asking questions. What answer are they going to read? Yours? Or your competitors? 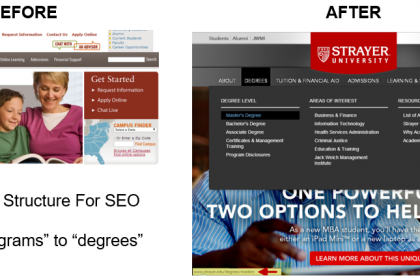 At Strayer University, I insisted on changing the URL structure for the website to increase organic traffic. Specifically, I knew from customer research that people were not looking for a “business program.” They were looking for “business degrees.” By changing the URL structure on the website, we almost doubled organic traffic YOY. In a highly competitive market, impacts to your website’s traffic volume could be the difference between gaining an advantage, holding ground or substantially losing ground. 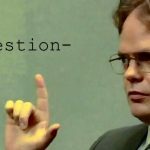 What are the goals of this content (why are we creating it)? What are the goals for the business (how do we make money)? What does it need to solve for the consumer (what is the audience intent)? Who do we have internally or externally that can create this content? When do we need to deliver it so it makes an impact? How are we going to measure that impact? If you can answer these questions before you create content or before you create your overall strategy, implementation should be the easiest part of the process. Lastly, we come to measuring results. There is a lot of information about this in the Webinar. To put it simply though, measurement always comes back to the goals you defined at the start. What are you trying to achieve with this content? I always want to simplify this for my customers. Most of the time, measuring comes down to leads and sales. But that does not always have to be the case. Content can be produced to improve customer support. In that case, you want to measure sentiment – how are your customers feeling about you and what are they saying. Were you able to take negative views and change them back into positive ones? Content also can produced to deliver delight and enjoyment, or engagement. Motivational messaging, sharing a tactic that will help a company improve a business process, or challenging people with a hot topic ALL have a place in content marketing and all could be measured a bit differently. 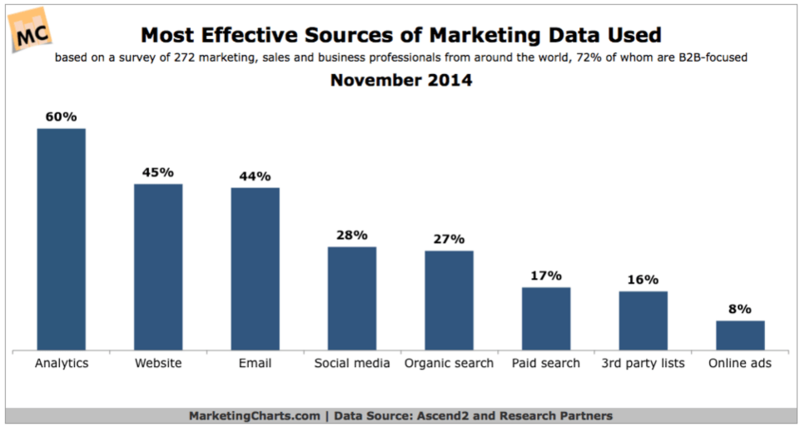 In the chart below, Marketing Charts has listed the most effective sources of marketing data that marketers use. But do not let that confuse you. Social media data and paid search data, for example, can be very effective sources. The question is – do you have access to the data? Do you know how to access it? Or do you know how to use it? Many people will present data just to present data. But what STORY does the data tell? That is ultimately how you want to explain your success – by a story that shows how you started, what the journey was like and what the next steps in that journey are going to look like. If you have questions about this article or the webinar, or are interested in creating a content marketing strategy or enhancing your existing program, please e-mail Michael Hackmer directly at: michaelhackmer@socialwebtactics.com.